Raytec provides a full range of Infrared, White-Light and Hybrib illuminators for the CCTV Professional. Designed for Raymax Infra-Red and Raymax White-Light illuminators, Adaptive Illumination allows the installer to adjust the angle of the light projection from a single unit to fit the specific demands of any installation. Adjustment is quick and convenient and any angle up to 180 degrees (depending on model) may be selected. Cutting edge materials science techniques have been employed to maximise thermal efficiency throughout the unit. Cool Running is specifically designed to allow all Raytec LED products to provide exceptionally long life - up to 10 years. The future of lighting is surface mount LED technology. Compared to standard through-hole LED�s, surface mount LED�s are a more robust solution increasing reliability and improving product life. They are also far more efficient at the dissipation of heat allowing the LED�s to run at higher power and achieve significantly improved performance. The polycarbonate lens design protects against severe blows from crowbars, baseball bats and can even withstand shots from air pistols and rifles (range dependant). All Raytec illuminators use high efficiency LED�s and advanced control methods to deliver extremely low electrical consumption. 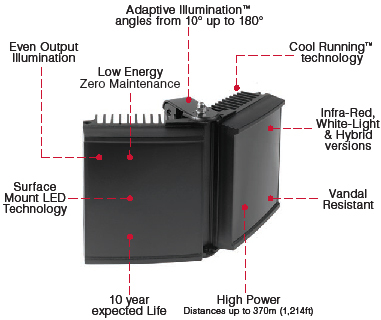 Raytec illuminators are energy saving and deliver huge savings in running costs compared to traditional bulb illuminators together with zero maintenance. High Definition Lighting allows cameras to provide crystal clear, high signal images during the hours of darkness. The breakthrough in HD lighting is made possible with Raytec�s high power LED technology delivering increased power on scene. High definition cameras require high definition lighting.